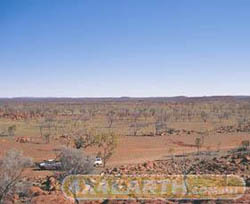 The approximate 3,500 kilometre Gunbarrel Highway road via Victory Downs near the Northern Territory/South Australian border, east across to Giles, and on to Carnegie Station in Western Australia.The trip should only be attempted in four wheel drive high clearance vehicles as the roads are natural earth and gravel and some have nevre been serviced.Much of the journey travels through Aboriginal Reserves, in Western Australia, and Aboriginal Land in Northern Territory. Entry permits are required and must be sought prior to travel. For further details on entry permits visit www.dia.wa.gov.au.